The geckos diet should consist of drosophila, small crickets, ripe fruits and baby food containing fruits. In the wild besides feeding on preyed food items they lap up nectar from flowers (Perry / Ritter, 1999). In households they were observed while consuming honey, jam, juice, sweetened tea and coffee (Nietzke, 1998; Seufer, 1995). Several people reported encountering the geckos in discarded cans of sweetened drinks or feeding on ripe fruit left on the kitchen table (Perry / Ritter, 1999). As the geckos are very productive providing calcium steadily is essential to keep them healthy. Soft shelled eggs are an acute sign of lack. Healthy geckos possess visible calcium sacs reaching from the neck to the shoulders. The calcium sacs (endolymphatic organ) contain a lot of calciumcarbonat which the females need for egg production. According to observations of Rösler himself the calcium sacs decrease during egg genesis but thereafter relatively soon reach their original size again (Rösler 1991 a; Source: Rösler 1995). Possibly they also serve as an organ of equilibrium. The food insects usually are dusted with a mixture of mineral supplement and vitamin supplement (1:1). Some also mix baby food on fruit basis with some mineral supplement (works fine in my geckos, too). Anyway, it is a good idea additionally to offer the geckos fine calcium grit mix for pigeons or mineral supplement in a dish for enabling the geckos to take it whenever they want. For calcium resorbtion vitamin D is necessary and thats why it is included in most vitamin supplements. You should keep this in mind and when giving vitamin D especially care for sufficient calcium supply. If you provide vitamin D without giving calcium calcium is decompositioned from the sceleton which finally results in rachitis. Hanley et. al. (1994) indicate that Lepidodactylus lugubris on Takapoto Atoll mainly consumed Amphipods identified as the commmon Indo-Pacific species Orchestia anomala. Hidetoshi Ota (1994) reported that on Kita-Daitojima Island, Ryukyu Archipelago, Isopoda and Blattaria were the most frequent food items of Lepidodactylus lugubris and Hemidactylus frenatus during the winter. During the other seasons both preyed most frequently on Diptera and Hymenoptera as well as on Lepidoptera. 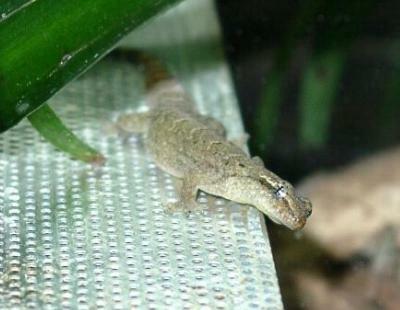 As they are able to walk on the walls and the ceiling, the geckos will do well also in a smaller sized terrarium. As they are arboreal geckos they should like terrariums which are higher than long. Often keepers prefer smaller terrariums because the geckos are easier to observe in such enclosures, but if you have seen the geckos jumping through the terrarium at night, you perhaps will grant them a larger terrarium. Referring to the area of the walls and ceiling (the geckos seldom move on the bottom) a population size of 21 geckos was calculated for the hut. 32 x 18 x 23 cm enclosure none of both was effected negatively (Brown and O' Brian, 1993). I keep my 5 adult geckos together with their juveniles in a standard terrarium (double sliding doors) measuring 80 x 40 x 50 cm. I also kept 8 adults over a several months in this size of terrarium without problems. Do not overcrowde the terrarium as this may result in serious health problems of the most subordinate geckos, possibly caused by stress. Special gecko terrariums with hinged front door set at an angle are suitable for preventing a dirty front (The gecko excrement is not unlike bird droppings) and of course in many cases may be safer, but it is possible to use standard terrariums, too. Very important (especially if you keep young geckos) is that the terrarium does not give the geckos any chance to escape. 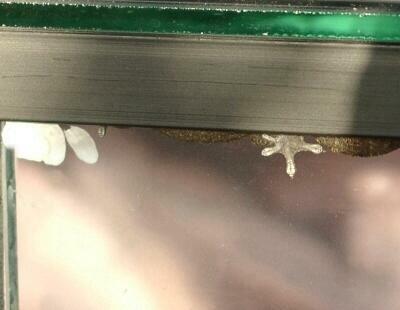 The gap between the slides in usual standard terrariums can be fixed by sticking foam rubber between the slides. If you use a standard terrarium, carefully check the guideways before any moving of the sliding doors! (If you keep young in the terrarium also look into the gap above the inserted sliding door) The geckos love to rest in the guideways. 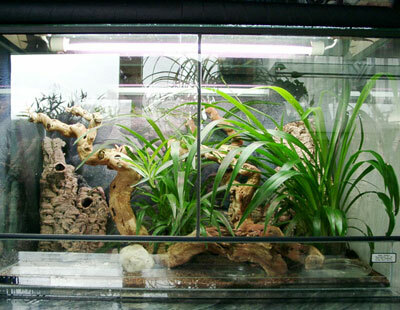 As in other gecko species living in human enclosures in the wild also Lepidodactylus lugubris under suitable conditions might be kept free in the room for example in the heated terraria room with enough food available (Henkel / Schmidt, 1991). But this should be considered carefully as it might be risky (accidents at doors a.s.o.). Nietzke (1998) indicates daytime temperatures should be around 28 °C. At night temperature may drop. In small terrariums these temperatures can be achieved by use of a 40 W light bulb which also should provide adequate light. In larger terrariums for heating heat cables or heating pads are suitable; for lighting fluorescent tubes (Nietzke, 1998). 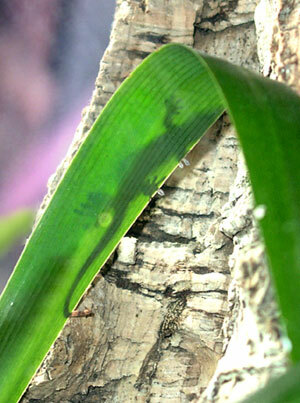 As Lepidodactylus lugubris is mostly active at night no special UV lighting is necessary. In my 80 cm terrarium I use two 18 W fluorescent tubes (daylight/GroLux). For improving observation at night you may use a cheap night light (available at Do It Yourself markets). Regarding temperature I heat only one half of the enclosure by a heating pad below the terrarium for offering the geckos differently temperatured areas. 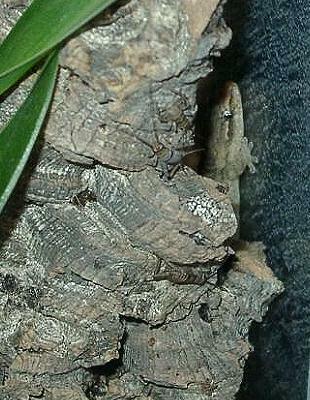 However the different Lepidodactylus lugubris clones live in very differently temperatured climates. On Oahu (Hawaiian island) for Lepidodactylus lugubris daily temperatures year-round range from min 20,5-23,5°C to max 29-32°C (Werner, 1989/1990). But there are also populations managing longtime cool periods, like that on the subtropical Kita-Daitojima Island (Ryukyu Archipelago) where Lepidodactylus lugubris stands mean temperatures of only 19,9°C in January but 28,3°C in July (Ota, 1994). In 1994 Bolger and Case stated significant differences in preferred temperatures for the three major Fiji clones 2NA, 2NB and 3NB (designated by Moritz et al, 1993: 2N and 3N for ploidity, A and B for mitochondrial DNA haplotype). Clone 2NB was collected at sites not above 235 m.
Clone 2NA was captured at sites as high as 835 m.
Clone 3NB was extremely rare below 100 m (1%), but predominated at the two highest elevation sites (42% and 100%) and was observed to be active on significantly cooler nights. Tests at laboratory showed that the mean preferred temperature of clone 2NB was 1,5 °C higher than that of clone 2NA. But they did not differ significantly in critical maximum (37,2°C / 37,3°C) or minimum temperatures (12,1°C / 12,0°C). Clone 2NA was the predominant clone at 27 of 34 sites surveyed in nine Pacific archipelagoes and is the most widespread. It has been recorded from the Cook Islands, Society Islands, Tuamotu Archipelago, Marquesas Islands, Hawaiian Islands, Fiji, Vanuatu and the Solomon Islands. The 3NB clone prefering cooler climate is also widespread having been recorded from Hawaii, the Tuamotus, the Cook Islands, Samoa, Fiji and Australia. Clone 2NB with higher prefered temperature has only been recorded from Fiji. On Oahu Werner (1989/1990) made the unusual observation that some Lepidodactylus lugubris lived in the rocks and that those specimens appeared to enjoy the advantages of approximating their preferred body temperature for more hours per day than did those in the trees. He asked himself if the Lepidodactylus lugubris in the rocks were a distinct subpopulation but finally assumed the answer pobably might be negative. However, Lepidodactylus lugubris (and also Hemidactylus frenatus) are very flexible in thermal regime which preadapts them to migration and invasion of houses (Werner, 1989/1990). Werner and Whitaker (1978) reported that Lepidodactylus lugubris (and also Hemidactylus frenatus) appear to heliothermic thermoregulate in daytime by a combination of open, protected and indirect basking and indicated a preferred body temperature of 28 °C for Lepidodactylus lugubris (Hemidactylus frenatus approx. 29 °C). 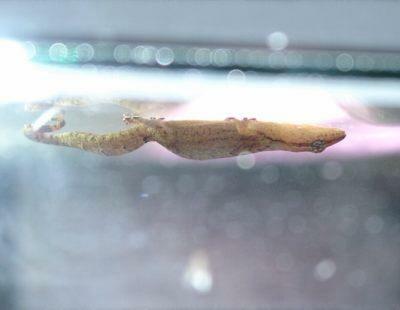 Pregnant females have a higher preferred body temperature and occupy warmer sites than nonpregnant (Werner, 1990): Body temperature of gravid female Lepidodactylus lugubris on Oahu averaged 0,3-1,1°C higher than that of nonpregnant females (same value for gravid Hemidactylus frenatus). Werner (1990) concluded that gravid females behaviorally thermoregulate this higher body temperature as it may improve their fitness. For example elevating the incubation temperature accelerates embryonic development, abbreviates the period of increased maternal vulnerability to predation. Terrariums for Lepidodactylus lugubris neither should be dry nor rain forest terrariums. Somewhat drier should not be harmful. Spraying 1 - 2 times a day should be adequate. 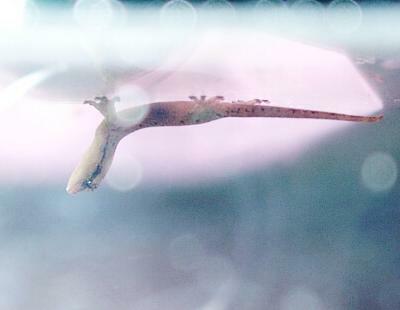 The geckos like licking water drops from the terrarium walls. A shallow dish of water always must be available in the terrarium, too. The geckos use it. Branches und cork bark tubes or pieces of cork bark leaned on the terrarium walls for climbing and hiding. Sandy soil may be used but other substrates are used as well. 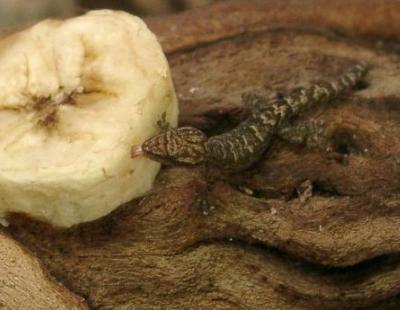 As in their natural habitats Lepidodactylus lugubris often live on cocnut trees, cocos substrate should be suitable, too. For planting often Ficus pumila is chosen. G. Nietzke (1998) proposes to plant Fittonia verschaffeltii, Ficus repens, Ficus sagittata, Tillandsia and smaller Vriesea species. I myself use potted spider plants (Chlorophytum). Because of the small size of Lepidodactylus lugubris keeping them together with other geckos in most cases is not successuful. When kept together with Phelsuma species Lepidodactylus lugubris often were seriously injured. A several keepers reported that keeping together with poison arrow frogs works fine.